Marla C. Berns, the Shirley and Ralph Shapiro Director of the Fowler Museum at UCLA, received the medal of chevalier of the Order of Arts and Letters of the French Republic at a Nov. 12 ceremony at the Quai Branly Museum in Paris. The ceremony, conducted by Quai Branly Museum president Stéphane Martin, took place at the opening of "Secrets d'ivoire: L'art des Lega d'Afrique centrale," an exhibition of the Fowler Museum's unparalleled collection of African artwork by the Lega peoples of the Democratic Republic of the Congo, which was donated to the Fowler by collectors Jay T. and Deborah R. Last. 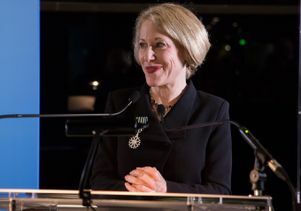 Membership in the Order of Arts and Letters, established in 1957, is awarded by the French minister of culture in recognition of eminent artists, writers and scholars. Recipients of the award are admitted into the order as a chevalier, or knight. 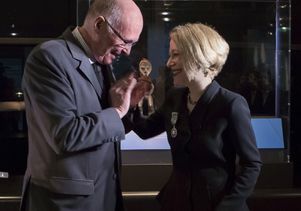 Berns was honored for her contributions to knowledge of the arts and artists of Africa and her promotion of cultural exchange between France and the United States through the Fowler's ongoing partnerships with the Quai Branly Museum. Like the Fowler Museum, the Quai Branly Museum is devoted to exploring the arts and cultures of Africa, Asia, the Pacific and the Americas. It opened on its site near the Eiffel Tower in 2006. "Secrets d'ivoire" is the second Fowler Museum exhibition to appear at the Paris museum. "Central Nigeria Unmasked: Arts of the Benue River Valley," for which Berns served as lead curator and co-editor of the related scholarly publication, was on display there in late 2012 and early 2013 as part of a three-venue tour. An upcoming Fowler Museum project currently in development, "Striking Iron: The Art of the African Blacksmith," will appear there in 2016–17. Berns has served as the director of the Fowler Museum at UCLA since 2001. In 2007, her position was endowed by Los Angeles philanthropists Shirley and Ralph Shapiro in recognition of her outstanding contributions to UCLA and the community. Prior to tenure at the Fowler, Berns was director of the University Art Museum at UC Santa Barbara for 10 years. She received her Ph.D. in art history at UCLA, specializing in African art. Her research and writing has concentrated on women's arts of northeastern Nigeria, where she did fieldwork in the early 1980s, and encompasses ceramic sculpture, decorated gourds and programs of body scarification. She has published and lectured widely on these topics. One of the most significant initiatives Berns has launched as director came to fruition in 2006 with the opening of "Intersections: World Arts, Local Lives," the museum's first long-term exhibition of highlights from its renowned permanent collection. The exhibition features a unique thematic and cross-cultural approach, incorporates a wide range of technologies, and has become a staple for K–12 and college-level multicultural education in the Los Angeles area, as well as a favorite stop for general museum visitors interested in world arts. In addition to continuing the Fowler's pioneering work in presenting global arts and cultures, Berns has encouraged the presentation of the work of contemporary artists in exhibitions that speak to both the ongoing dynamism of world cultures and to the resonances between contemporary art and traditional practices. To that end, the Fowler has presented several much-praised solo exhibitions, including the work of the celebrated Ghanaian artist El Anatsui (2007), Cuban-born artist José Bedia (2011), San Francisco-based performance and photo-conceptual artist Allan deSouza (2011) and the riotous "soundsuits" of Nick Cave (2010), one of the museum's most popular exhibitions to date. The Fowler Museum is in the midst of a yearlong celebration of its 50th anniversary following Berns' vision of this milestone event. "Fowler at Fifty," which began in mid-October and continues into early fall 2014, celebrates the remarkable trajectory of the museum's growth over the last five decades. Currently on display is a suite of eight exhibitions, each of which highlights a particular strength of the museum's vast holdings and takes a distinctive curatorial approach or engages an artist's perspective. Together, the eight anniversary exhibitions reveal the depth, breadth, range and quality of the museum’s collections, which number more than 120,000 objects, and also are a testament to what an institution can do with such expansive resources. The Fowler Museum at UCLA is open Wednesday through Sunday from noon to 5 p.m., and on Thursday from noon to 8 p.m. The museum is closed Mondays and Tuesdays. The Fowler Museum, part of UCLA Arts, is located in the north part of the UCLA campus. Admission is free. Parking is available for a maximum of $12 in Lot 4. For more information, the public may call 310-825-4361 or visit www.fowler.ucla.edu.